From tantrums to potty training, the toddler years are some of the trickiest a parent will ever face. 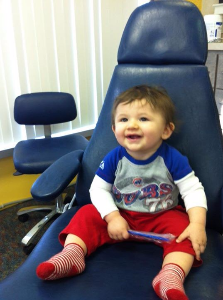 However, when it comes to many toddlers, one of the biggest struggles comes when you walk into the dentist’s office. It's not uncommon for your toddler to be a little nervous or downright unruly inside the office, which can make it difficult for the dentist to do his or her job effectively. Don't allow your toddler's fears to get in the way of protecting his or her oral health. Instead, here are a few ways to keep your little one calm while in the dentist's chair. Although it might seem easier, it's never a good idea to simply show up at the dentist office without giving your toddler a heads-up. Chances are, this news will be very distressing, which will lead to an even bigger tantrum. Instead, sit your toddler down a few hours prior to the visit. Let them know that you are going to the dentist, but there is no reason to be scared. Remind them that the dentist’s office is a fun place filled with nice people. Keep this conversation short and sweet, and focus on a special activity you will enjoy after the appointment. For example, let your toddler know that if he or she is cooperative at the dentist appointment, the reward will be a fun afternoon at a favorite park or a visit to the local ice cream shop. For many toddlers, fear of the unknown causes negative outbursts at the dentist’s office. One of the easiest ways to overcome this fear is to set up a pretend dentist’s office at your house. Find toys or kitchen utensils that can be used as makeshift instruments, and take turns playing the dentist and the patient with your toddler. While enjoying this fun activity, if your toddler becomes upset or expresses fear about the dentist, reassure them that you will be there the whole time, that the appointment will be quick, and that the staff is very nice and gentle. Another great way to put an end to your child's fear of the dentist, which will in turn make the appointment much less dramatic, is to tour the office. Call ahead and ask a member of the staff if it is okay to take your toddler for a walk through the office to see the facility and meet the dentist and hygienist. When you arrive at the office, don't be afraid to let your toddler explore and interact with the staff. This will help ensure that the next time you visit; your toddler will feel more comfortable. Bring along a distraction for your toddler. This could be anything from a handheld video game to their favorite book or toy. Let your dentist and hygienist take the lead. Remember, even though your first instinct as a parent is to step in when your toddler is upset, the dental staff knows how to work with and calm a frightened or unruly toddler. Finally, one of the easiest things you can do is simply reassure your toddler. Don't leave your toddler's side, hold his or her hand, and praise your child for his or her courage throughout the appointment. Taking your toddler to the dentist can be challenging. If you have any questions about your toddler's oral health, don't hesitate to contact the professionals at Milner Dentistry!